Which disciple was a thief? The Garner Ted Armstrong TV program is more than just news and good reporting. It offers biblical solutions and answers to critical problems that face the average American and Canadian today. This unusual telecast gets down to the nitty-gritty of a problem - making it factual and interesting. 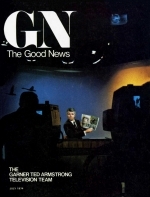 In bringing the advanced news of the wonderful world tomorrow, Mr. Ted Armstrong combines up-to-the-minute reports with biblical prophecy. No other program gives such unique insight into world news. The Worldwide Church of God has commission to preach to all nations concerning the good news of the coming millennial reign of Jesus Christ (Matt. 24:14; 28:19-20; Acts 1:8.